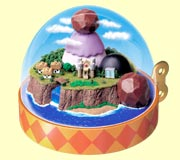 The music box is the setting of the game Wario Land 3. While it appears to be an ordinary instrument, it contains an entire world inside of it. The world consists of an island divided into four sections: North (the game starts here), South, East, and West. During the events of Wario Land 3, Wario crashes his airplane into a large forest while out flying. He eventually finds the music box inside a nearby cave, continually trying to play it before giving up due to his lack of success. As Wario was complaining over the past events, he was engulfed in a flash of light and soon found himself inside the music box, where he was greeted by a hidden figure who claimed to have once been the world's god. According to this figure, a wicked spell was placed upon him that had sealed him within the room they conversed in. The power used to seal him away was contained in five small music boxes; as such, collecting these music boxes could allow the figure to escape his curse and free the world. Though Wario seemed initially uninterested in the figure's request to lift the spell over him, his mind was changed when he was told that he could keep any treasure he found on his way and would be brought back to his own world in the end. Wario eventually collected the music boxes and assisted the figure, but a terrible truth was revealed to him as he did so: the hidden figure was actually an evil being who had previously put a curse on all the world's native inhabitants, turning them into the monsters Wario had faced on his quest. He and Wario eventually face off in a fight, which Wario ultimately won. Afterward, his curse over the people of the music box was lifted and Wario was not only allowed to exit the music box, but he was also given permission to keep all the spoils he had earned in his adventure. N: The game starts here, and it includes The Temple (the place where a hidden figure is imprisoned), Out of the Woods, The Peaceful Village, The Vast Plain, Bank of the Wild River, The Tidal Coast, and Sea Turtle Rocks. W: This section includes Desert Ruins, The Volcano's Base, The West Crater, The Pool of Rain, Beneath the Waves, and A Town in Chaos. S: This section includes The Grasslands, The Big Bridge, Tower of Revival, Cave of Flames, The Steep Canyon, and Above the Clouds. E: This section includes The Stagnant Swamp, The Frigid Sea, Castle of Illusions, The East Crater, The Colossal Hole, Forest of Fear, and The Warped Void. The music box (or perhaps some sort of replica of it) made two brief cameos in the intro to Wario's stage in WarioWare: Twisted!, where it was shown on top of a piece of furniture in Wario's House. This page was last edited on December 8, 2018, at 08:58.